Coming off a most successful IMSA season, Wright Motorsports has entered the No. 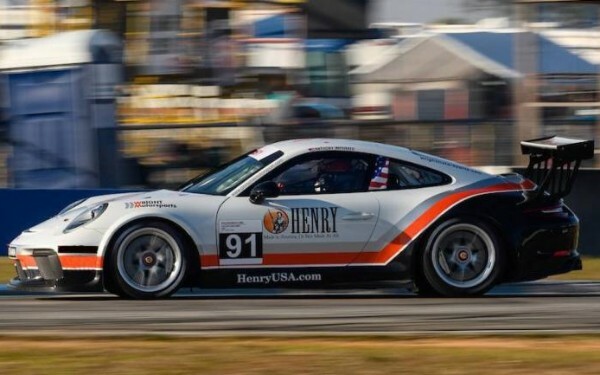 91 Wright Motorsports/Henry Repeating Arms Porsche 911 GT3 Cup car in this weekend’s Hankook 24H of COTA. The potent driver lineup will feature IMSA GT3 Cup Challenge regulars Anthony Imperato, McKay Snow and Fred Poordad joining forces with Belgian Porsche ace, Jan Heylen. The Hankook 24H of COTA will mark Wright Motorsport’s series debut in the four-stop 24H Series. In addition to the bulk of international competition, the group will be joined by a number of the same teams and drivers whom they competed against during the 2018 IMSA GT3 Cup Challenge season. Though new to endurance racing, Anthony Imperato will enter the event surrounded by all things familiar. Climbing back behind the wheel of the Porsche 911 GT3 Cup car that he’s had much success in over the last two IMSA seasons, the New Yorker is prepared to take on a track that he knows all too well. No stranger to Wright Motorsports is McKay Snow, who returns to the team after a one year hiatus from racing. The now 20-year old is prepared to enter what will be his third 24H Series race—having competed in the 2017 COTA 24H and Dubai 24H. A native of San Antonio, Texas, Fred Poordad will feel right at home at the Austin-based road course. With heaps of momentum to carry over from the IMSA season, the longtime Wright Motorsports driver is eager to take on what will be his first 24-hour race on home turf. Completing the lineup will be sports car racing veteran, Jan Heylen. Heylen holds a longstanding relationship with the Ohio-based team not only as a driver, but as the coach for their IMSA GT3 Cup Challenge program. Originating from a strong open-wheel background, the Belgian carries much success driving Wright Motorsports prepared Porsches in the endurance format. Wright Motorsports will take the stage for the Hankook 24H of COTA Saturday, November 17 at 9:00am CT. The race will run for 15-hours before taking a mandatory “intervention break” at 11:00PM CT, to accommodate local noise regulations. The event will then resume at 8:00AM CT on Sunday morning. Full coverage of the event to it’s entirety can be found at http://www.24hseries.com.